President Trump has had one consistent theme from the first day he entered the race for the White House: "Jobs, jobs, jobs." He thinks a lot of Americans urgently need work. That's not what the experts say. Most economists believe that America is at full employment. After all, the official unemployment rate is a mere 4.5%, the lowest level in in years. "I'd say we're doing pretty well," Janet Yellen, the head of America's central bank, said in March. Trump thinks the experts are wrong, just like they were about the election polls. On the campaign trail he trashed the official unemployment rate as "a joke." He believes there are a lot of sidelined workers who gave up job hunting. They aren't counted in the official unemployment rate, which only tallies people who actively searched for work in the past month. He's thrown out some wild numbers. He's said the true unemployment rate is 42% and that 94 million Americans are sidelined from the workforce. There's no data to back that up. CNNMoney (and many others) have debunked those claims. But Trump does have a point: The current economy hardly feels like "full employment." In fact, once you dig into the numbers, you know why. Too many people are stuck in part-time jobs, and not enough people are working at all in their "prime years" between ages 25 and 54. "It's hard to know what to call this. But it does not act like it is full employment," says Robert Brusca, chief economist at FAO Economics. Over 14 million Americans want a full-time job and can't get one, according to the Labor Department. CNNMoney also finds that an additional roughly 2 million Americans fall in that "sidelined worker" category. Getting those people off the sidelines won't be easy. Most haven't worked in years. They lack key skills. This doesn't mean the unemployment rate is "phony," but it does mean the power brokers on Wall Street and in Washington need to look beyond the usual data to judge the health of the job market. "We have two labor markets," says Kate Warne, an Edward Jones investment strategist based in Missouri. We have skilled workers like the Google techies and then a "much larger pool of people with skills that don't match current jobs." Every month, the Labor Department puts out the official unemployment data. Its latest count says there are 7.2 million unemployed. These are the people who are represented in the 4.5% unemployment rate. On top of that, the Labor Department also puts out "alternative" measures of unemployment. For example, there are 5.6 million Americans stuck in part-time jobs because they can't get a full-time role. Before the Great Recession, only 4.5 million were stuck in part-time gigs. "We have so many people working below their skill level and potential," says economist Brusca. 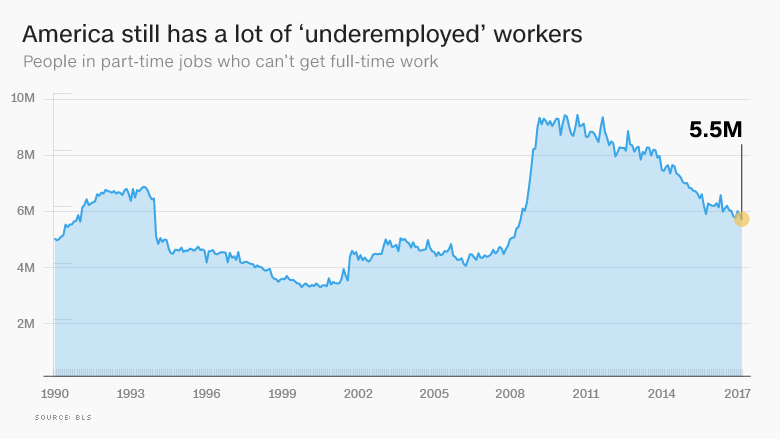 He's dubbed this the era of full "UNDERemployment." Additionally, the Labor Department reports there are 1.6 million "marginally attached" workers who searched for a job at some point in the past year but gave up looking recently so they aren't counted in the official unemployment rate. Put all this together and you get 14.4 million people who need a full-time job. Richard Moody, chief economist at Regions Financial Corporation believes a truly healthy economy would only have about 13 to 13.5 million people trying to find full-time work. The other red flag right now is that a lot of people in their "prime" years aren't working or even looking for a job. They're on the sidelines for reasons we don't fully understand. From 1990 through 2007, nearly 80% of prime-aged Americans (ages 25 to 54) were working. Today only 78.5% of that group is working. To put it another way, if the US had closer to 80% participation again, 1.7 million more people would be working today. 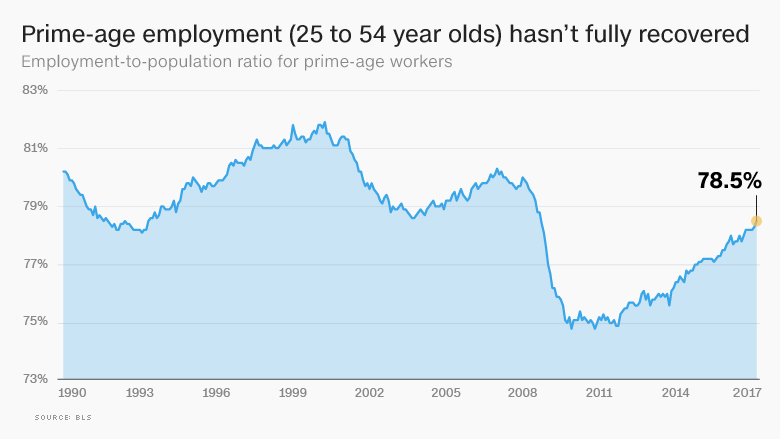 If you include all workers over 16, there's a case to be made that over 2 million more adults should be working, although aging Baby Boomers probably don't want to work as much as they did in the past. Can Trump get these people back to work? Top economists like Federal Reserve chief Yellen acknowledge that these alternative measures of unemployment don't look nearly as healthy as the 4.5% unemployment rate that makes headlines. But they debate whether these workers have the skillset to ever get jobs again. In survey after survey, businesses complain they can't find any qualified workers to fill their job openings. The NFIB, the largest small business organization in the country, says we are living through one of the "tightest" labor markets in 40 years. "Small business owners reported few or no qualified applications for the positions they were trying to fill," the NFIB said in its latest survey. Trump thinks he has the recipe to get millions of "forgotten people" off the sidelines and into the workforce again. It's certainly encouraging that almost 370,000 prime-age workers have found jobs since the start of the year, a continuation of the rebound of the past few years under President Obama. 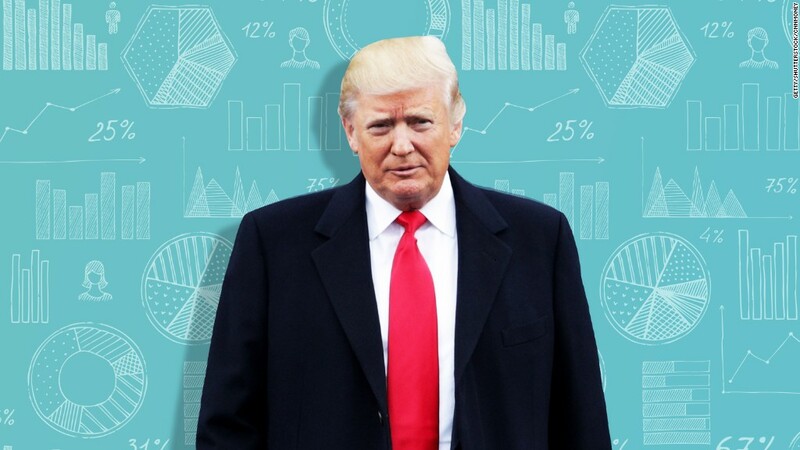 Time will tell whether the United States has hit peek employment or whether Trump is right and more people can be lured back into the workforce if they believe the economy is better. "Full employment isn't a straightforward calculation. It's more of an art than a science," says Megan Greene, chief economist at Manulife Mutual Funds.